So I've been meaning to share this recipe for a long time. This was the last recipe my brother Daniel shared with me (by request) before he suddenly passed away. He wrote the Pastel blog post on his Haggis and Herring blog in August of 2012 and then emailed the post to me to make sure I get the recipe. He passed away in September of 2012 before I got to try the recipe. The email sat in my inbox for over year. I stared at it everyday. I thought for the first anniversary of his death, I would make it. But I just couldn't. Maybe I felt that if I made the recipe, I would have to delete that email. So I made a slow cooker Haggis to honour him instead. But a week passed after his first anniversary, and I thought "you know what, I need to make this". Why? Because this recipe is more than just my brother. This recipe is my family, my heritage, my memories of childhood. So I made the recipe. But yet, it still took me over 5 months to write this post after I made the meal. But here I am, writing the post mid January of 2014. So what is Pastel? It is a Moroccan shepherds pie. Pastel was a common meal we would have at lunch at my grandparents for Shabbat lunch. My dads side of the family is Moroccan and has quite the contrasting flavours in food from my moms Polish heritage. Mama (my grandmother) passed away suddenly when I was in University (late 1990's). I was going home for reading week, and getting ready to celebrate my grandparents 55th anniversary at a Pizza Hut with anchovy pizza and beer. The time I got off the bus from Peterborough to Toronto and made it to my brothers place to be picked up, I received news that she had a stroke. She passed away that evening after having a chance to say goodbye to everyone. This was my first close loss and was quite upset as my family was really close. Since my Mama's death, I really hadn't had pastel. My dads side of the family had the recipe, but nobody really made it. Making this meal was my opportunity to pay tribute to my Mama and fulfill that last recipe request from my brother. So I invited my in-laws over for dinner to share in this experience knowing that they would not have tried pastel yet. They loved it (not surprising). So what sets pastel away from other shepherds pies? Sliced hard boiled eggs, for flavour and texture. 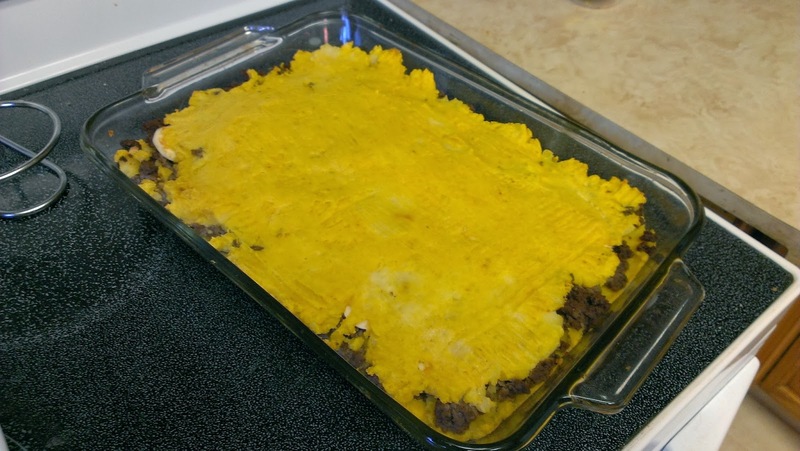 Standard shepherds pie is meat then potato. 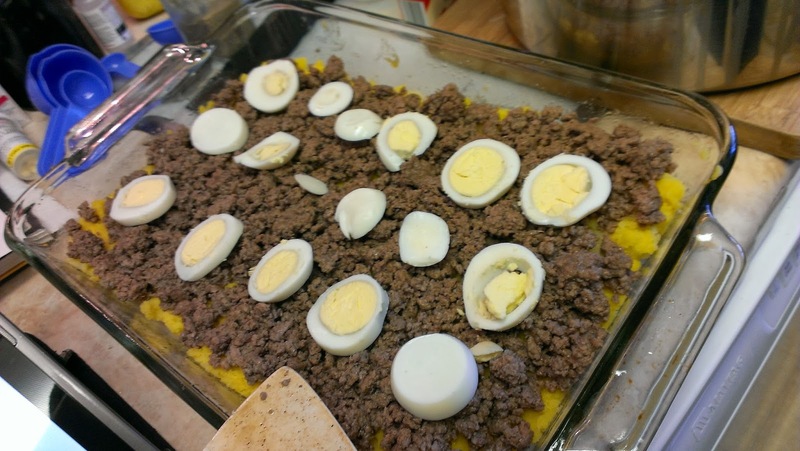 Pastel is layered, potato, meat, boiled eggs, potato. In a deep pan on medium heat, add beef, water and start to brown the beef, using a potato masher to break up beef. 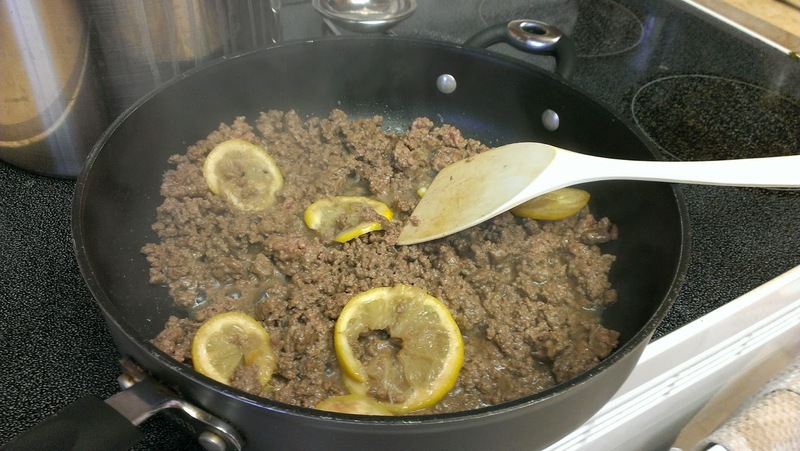 Add the lemon as soon as the meat starts to break up. Drain excess liquid and discard lemon, and add nutmeg, salt and pepper and set aside. 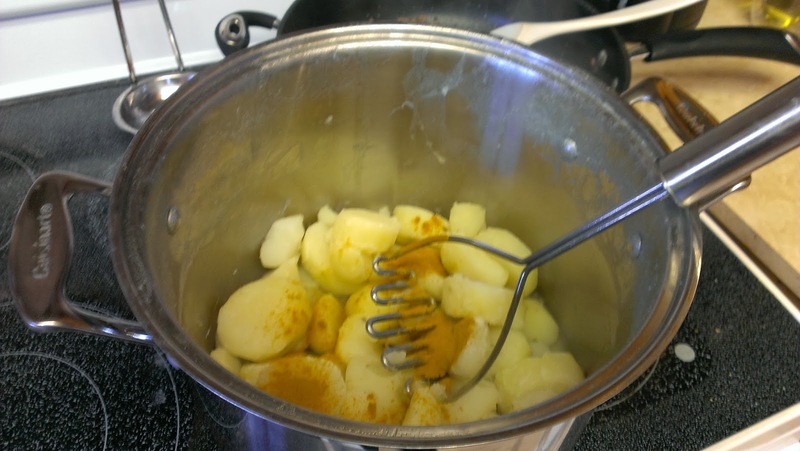 Combine the 1/2 cup of potato water and turmeric and mash the potatoes using the 1/2 cup of liquid. Separate into two portions. Grease the inside of a large casserole dish, (8" x 13") using the olive oil and gently spread half of the potatoes evenly across the bottom. Spoon the meat over the first layer and gently spread, trying not to compress the layer of potato underneath. Place the egg slices evenly over the meat. Lightly spread the remaining potato mixture over the meat and eggs and make a pattern (or just lines) using a fork. Brush the egg wash over the top layer of potatoes and bake for 45-60 minutes, until top starts to turn golden brown.